We’d love your help. 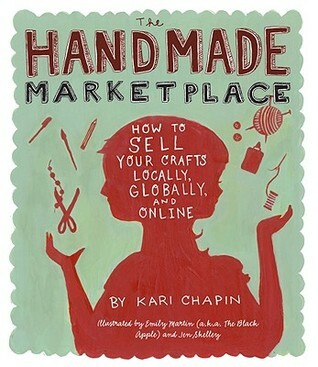 Let us know what’s wrong with this preview of The Handmade Marketplace by Kari Chapin. To ask other readers questions about The Handmade Marketplace, please sign up. To be honest, most of this book is written in Successful Blog Style. What is Successful Blog Style, you ask? Well, it's a style of writing that mainly says bland, incomplete, obvious things that you already know, but presented stylishly, charmingly, disarmingly and warmly. The premise is usually something you find deeply fascinating, that fills your mind with a sense of interest, curiosity, and promise. Ultimately the Successful Blogger sells (via advertising) this back to you. You often learn v To be honest, most of this book is written in Successful Blog Style. What is Successful Blog Style, you ask? Well, it's a style of writing that mainly says bland, incomplete, obvious things that you already know, but presented stylishly, charmingly, disarmingly and warmly. The premise is usually something you find deeply fascinating, that fills your mind with a sense of interest, curiosity, and promise. Ultimately the Successful Blogger sells (via advertising) this back to you. You often learn very little, because the Successful Blogger has learned to save time by presenting less substantial content after a great header, yet it reinforces your sense of style, current or desired, often cultivating a weird new spin on the Keeping Up With The Jonses dynamic. Well designed book (I mostly bought this because my friend Amber is quoted in it and because I loved the illustrations and design). The information presented is great, though available in other books. I would really **love** to have a similar book (or a chapter in a current book) devoted to indie marketing of "art" (such as original paintings for example). This book and others like it are helpful for artisans who make things - soap, mittens, stuffies, etc - but "art" seems to require a slightly t Well designed book (I mostly bought this because my friend Amber is quoted in it and because I loved the illustrations and design). The information presented is great, though available in other books. I would really **love** to have a similar book (or a chapter in a current book) devoted to indie marketing of "art" (such as original paintings for example). This book and others like it are helpful for artisans who make things - soap, mittens, stuffies, etc - but "art" seems to require a slightly tweaked marketing approach. I don't believe "art" and "indie" are mutually exclusive, though, and in fact would love to see more "indie" in the "fine art" scene. I don't remember how I came across this book but I sell on Etsy, so I was interested to know what this book was about. It has a lot of good information, some I already knew, and some was completely knew to me. I would recommend it to anyone who is thinking about starting selling their handmade treasures or who is already doing so. Lots of great information in one place! I have a crush on everything about this book. I checked this out of the library, then l found it so useful that I bought it on Amazon. It is chock full of tips from actual crafters who have turned a hobby into a business. It's an indispensable tool for anyone looking to make a living creating and selling their handicrafts. Thank you Kari Chapin and the members of your Creative Collective. I really found this book very useful and I am so glad I got the chance to review it. I have always wanted to learn how to list and sell my homemade crochet and scrap booking items. This book for me was a real tool to have not only does it tell you how to it also tells you how to get set up and started. The steps she takes you threw and the things you learn in this book will most definitely help you to set up your own business. I really enjoyed the chapters on social media, blogging and marketing. I really found this book very useful and I am so glad I got the chance to review it. I have always wanted to learn how to list and sell my homemade crochet and scrap booking items. This book for me was a real tool to have not only does it tell you how to it also tells you how to get set up and started. The steps she takes you threw and the things you learn in this book will most definitely help you to set up your own business. I really enjoyed the chapters on social media, blogging and marketing. I am a new blogger and my blog is only less than a year old but this was very helpful to me even for my personal blog I do. I'm not that computer smart and this is one great book that help me by the steps she lists in her book. This also helped me understand how to set my prices when I get ready to launch my craft web site in the future. That's the hard part for me is to determine how much my afghans I make are going for and how much is to much. The Book helped me understand the wholesale and retail sales and about them. This book was so helpful to me it would be hard to list everything I loved about this book. I would recommend this book for anyone who wants to know the how to's of the Homemade market place. The Handmade Marketplace is a wonderful resource for anyone who's thought about selling their art or handcrafted work. Kari writes in a friendly, conversational tone and guides the reader through all the ins and outs of operating a small business. A large variety of topics are discussed including marketing, branding, using social media in your business, how to take the perfect photos, selling in your community, legal details, shop policies, selling at craft fairs, and more! Included in the book a The Handmade Marketplace is a wonderful resource for anyone who's thought about selling their art or handcrafted work. Kari writes in a friendly, conversational tone and guides the reader through all the ins and outs of operating a small business. A large variety of topics are discussed including marketing, branding, using social media in your business, how to take the perfect photos, selling in your community, legal details, shop policies, selling at craft fairs, and more! Included in the book are fun illustrations and advice from other artists and sellers. This book is very approachable for those looking to take a side hobby of crafting and expand upon your opportunities. What I found most helpful were the different sites of other bloggers, podcasters, and crafty knowledge. As a former business major it is not at all the book you should get if you want to open a brick and mortar store or if you are going to be expanding over the size of you plus one. If you are looking for something like that please instead get New Venture Creation by Timmons it i This book is very approachable for those looking to take a side hobby of crafting and expand upon your opportunities. As a former business major it is not at all the book you should get if you want to open a brick and mortar store or if you are going to be expanding over the size of you plus one. If you are looking for something like that please instead get New Venture Creation by Timmons it is very comprehensive. A good starting point when thinking about going into the craft-selling business. Most of it is common sense, I think, but there are some helpful hints (the photography section is helpful). It will appeal more to those who really want to eventually make this into a business, as opposed to the hobby seller like me. Some of the info I just skipped over (not seeing myself podcasting). Breezy, fun overview of, well, how to sell one's crafts. It covers too much to be particularly in-depth- but it doesn't claim to be. Overall it felt like a series of magazine articles, with pull-quotes and boxes of more info and quirky but engaging illustrations. I don't know that I learned anything new, but I certainly read every word. I am actually reading this book. There are no pictures or sewing projects and I will soon finish it cover to cover! It is a good reference for using modern means to market yourself and your wares. It is inspiring. I also enjoy that there are numerous perspectives offered throughout the book, making this concept more tangible. A great, easy-to-read lil' book about making $$$ of yr arts, esp. if you're like me and don't understand how the hell the internet or money work. I love it when people give me money. I love it even more when people give me money for something I'm doing anyway, so I'm always on the lookout for ways to turn what I'm doing anyway into monies which I can then squander on unimportant things like the gas bill. When I saw The Handmade Marketplace on NetGalley, I was immediately interested. I hoped for a book which would give me some guidance to how one goes about selling things, both online and in general. I already have some knowledge about the avenues available and I spent many a Saturday as a teenager manning a stall for my Mammy's craft business. I have a degree of knowledge, but it's mostly out of date. What I got was a book which was ... mixed. The style is initially pleasing. The writing is chatty and positive without getting too rah! rah! about everything. Throughout, soundbites from crafters are provided and these often covered the points I felt were missing from the text. There are also some useful little Q&As which, again, raise the points I was going to complain weren't covered. It looks quite nice too, initially. The layout suits the chatty style of the writing, but it doesn't gel enough. If you're giving me something I can't read on my kindle, I'd hope there's a reason for it. Most of the cartoon images could have been taken from a stock site - they don't have anything to do with the text. There are a few places where some diagrams would have been useful, such as when talking about how to set up a home photography studio. I also found some of the more cursive fonts (used in the quotes from crafters) difficult to read (which I was doing on my PC). Where I struggle is in knowing who The Handmade Marketplace is aimed at. The style and the substance is pretty basic, but overall the book is teaching you how to set up a crafting *business* - rather than starting with where to sell, how to sell stuff, it begins with inspiration, branding, logos, and business practices. These are all useful things (I'm very glad to see branding covered, even if there are some massive gaps in the content, such as information about fonts and how visual identity works) but for a book which has the subtitle "How to sell your crafts locally, globally, and online"? Not so much. Some cameras allow you to easily adjust the white balance, which can result in crisper, clearer photos. When it's not missing things out, it offers some pieces of advice worthy of #Pippatips. In the evaluating a craft fair section, the book suggests you consider the time of year the fair takes place. If you knit winter hats or make letterpress Chistmas, Hanukkah, or Kwanzaa cards, a show in the middle of summer might not be the right one for you. But, it also has some excellent advice which may not have occurred to anybody who's new to craft fairing, such as asking what other kind of artisans are going to be at the fair. It does a good job of covering the (very) basic things you need to know and suggesting ways to research the fair, but much of this information is bogged down in the chatty style - it's not a book to reference easily. Checklists would have been a big plus. It also covers things I wouldn't have thought to cover, like what happens if you apply to attend a fair and get rejected, and I think that's probably a really good place to explain why this book doesn't do it for me. I'm not precious in general, and I'm utterly unprecious about business things. Yes, I get the same sense of pride as anybody else putting my stuff out there into the big wide world for people to part with money for - and I'm talking about all sorts here: writing, design, illustration, craft - but once it's out there I'm done with it; anything from that point on is just numbers. Sure, it's disappointing when things don't get accepted places you thought they would, or something doesn't sell as well as you hoped, or any other form rejection can take. There is a flipside: the unexpected joy, or more often bewilderment, of something doing better than you believed it would. Even that, though, is just numbers. When somebody tells me to give me a hug for all my hard work, especially when it's for something fundamental to the job I am trying to have, I want to respond with a Grumpy Cat gif. You come out smelling like roses compared to Ms Crankypants. Which is right up there with being thanked for a negative review so the author can show everybody how nice and great they are even though this meany-boots didn't like their book. It's passive aggressive and it's not on. I borrowed the book from the library and am going to purchase. I'm new to the whole selling thing for all my crafts and this was a great instructional for when I have enough inventory to sell! Create a web page (or have someone do it for you) and take beautiful pictures (or have someone do it for you) of your crafts to add to the page. Be sure to tweet, blog, chat, and post. And don't forget to visit cradft fairs and read your camera's manual. Great tips from people in the business, many encouraging words, and some practical advice to get started. The format was hard to read--sort of like the scattered online reading. By this time, I think a newer publication might be more relevant than this 2011 publication. Not so relevant to me. This updated edition is full of creative ideas and practical advise for crafters wanting to break into the market. The author provides plenty of resources for further information. She makes the crafting world sound more collaborative than cutthroat competitive. Her writing inspires me to try something new! Kari Chapin collected a group of nineteen talented artisans that sell their work, calling them her Creative Collective, and asking them the questions that the reader would ask. Their comments are quoted in side notes sprinkled throughout the book. I found the comments of the collective to be thoughtful, wise and invaluable to someone wanting to beginning selling their own creations. But that’s just the beginning of the information in this book. Chapin organizes the book into three general parts: Kari Chapin collected a group of nineteen talented artisans that sell their work, calling them her Creative Collective, and asking them the questions that the reader would ask. Their comments are quoted in side notes sprinkled throughout the book. I found the comments of the collective to be thoughtful, wise and invaluable to someone wanting to beginning selling their own creations. But that’s just the beginning of the information in this book. Chapin organizes the book into three general parts: getting to know yourself and your business; spreading the word and images; and getting down to selling. In the first section, she talks about branding your business and establishing good business practices. This is the time to decide how the business will run, and who will help you. Writing a business plan is touched on, as is managing the mundane, like accepting credit cards. The author emphasizes the importance of laying down a good business foundation for your fledgling enterprise. In the second section, she details ways to get the word out about your business. Let’s face it, many businesses fail because nobody knows they are there, wherever ‘there’ is. What do you already know about marketing and advertising? How about photography and your artistic community? The author encourages the reader to think outside the box when it comes to getting the word out, using both your online presence and tangible, touchable aids, like business cards. Social media cannot be ignored these days, and she outlines how blogs, Twitter and Pinterest, among others, can help you bolster your business. In the third section, the reader will be encouraged to understand how to sell. Will you want to go to craft fairs and sell your wares? Will you establish on online shop, either with your own website, or using an established marketplace like Etsy? Will you call on shop owners and sell them your product for resale in their shop? Will you sell on consignment? There are lots of options out there these days, and the successful entrepreneur will want to explore all the choices before deciding. The book is written in a chatty, comfortable style that makes it easy to read and enjoy. The side notes from the Creative Collective are sprinkled throughout the book and perk up the text as you are reading. The author covers the subject well, and I found many good tips that I will use as I develop my business over the coming year. I enthusiastically recommend it. The Handmade Marketplace (2nd Edition) is an informative and inspiring book all about selling your own crafts and handmade goods. The book is well thought out with the chapters following topics in an appropriate order for those starting out on a new business venture. Amongst the chapters is advice on topics such as branding, pricing, working with others, hiring help, dealing with customers and marketing techniques (including blogging). 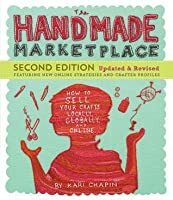 The book also talks about how to find inspiration for your wo The Handmade Marketplace (2nd Edition) is an informative and inspiring book all about selling your own crafts and handmade goods. The book is well thought out with the chapters following topics in an appropriate order for those starting out on a new business venture. Amongst the chapters is advice on topics such as branding, pricing, working with others, hiring help, dealing with customers and marketing techniques (including blogging). The book also talks about how to find inspiration for your work and how you can turn your ideas into a reality that could become your source of income. Scattered in between these sections are profiles on successful small businesses and quotes from fellow crafters sharing tips and advice based on their own experiences - The Handmade Marketplace certainly stresses the importance of community and working with others to improve your own skills. If you are just starting your own craft business, or are considering the idea, this would be a great title to pick up for tips on how to get set up. This book is not just for beginners though - as someone who has been selling handmade online for a few years I feel that there is always more to learn and I definitely found some great tips within The Handmade Marketplace! The addition of advice from successful sellers was particularly interesting to read as they provided a real insight into the reality of selling handmade. Information aside, the book is laid out is an easy to read format with a pleasant colour scheme and overall nice appearance perfect for a reference book. The only real downside for me was one that unfortunately couldn’t be helped. As the author is based in the US for some topics such as self-employment and taxes she is only able to provide information relevant to that area of the world. Of course, this is totally understandable as it would be impossible to include information for every country where someone might read the book (!) but this small section of information didn’t apply to me as a UK resident so I skipped over it. Having said that this small detail shouldn’t put you off of picking up this useful title and I would still recommend this book if you sell, or want to sell, handmade wherever you are based. Great information in this book if you're starting out trying to sell handmade goods. Most of it wasn't relevant to me, as a) I've been in this business for quite a few years now, and know most of the basics, and b) I don't sell finished handmade products, so the sections on craft fairs, consignment etc, while interesting, wouldn't apply to me! The tone is warm and friendly, and the layout and look of the book is charming. It's an easy and informative read. I did find a few sentences (about 3) th Great information in this book if you're starting out trying to sell handmade goods. Most of it wasn't relevant to me, as a) I've been in this business for quite a few years now, and know most of the basics, and b) I don't sell finished handmade products, so the sections on craft fairs, consignment etc, while interesting, wouldn't apply to me! The tone is warm and friendly, and the layout and look of the book is charming. It's an easy and informative read. I did find a few sentences (about 3) that made me go "huh?" because the words didn't make sense, but only one was so badly mangled that I couldn't decipher the meaning. A little extra editing before the next edition would be nice though. I know quite a few of the featured artisans, and it was nice to see their quotes and comments throughout the book! Each contributor was given a different 'handwriting-style' font for their comments, which, while being a cute touch, detracted from some of the advice because I had to struggle a little to read a few of them. I used a blank piece of paper as my bookmark while I read this book, and made notes of any points I wanted to act on for myself. Even though, as I said above, I already follow most of the good advice within this book, I ended up with three solid ideas for ways I can improve my business. 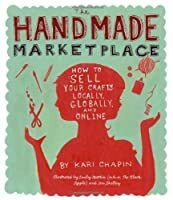 Handmade Marketplace: How to Sell Your Crafts Locally, Globally, and On-Line is a book for aspiring entrepreneurs who sell their wares. The book goes step-by-step through how to set up a business and explores the various venues in which one might consider selling their crafts. I thought this book was very informative, although somewhat broad and very much targeted to crafts (not as much targeted to selling paintings/artwork, which is why I was reading it). I think her structure is good and helpf Handmade Marketplace: How to Sell Your Crafts Locally, Globally, and On-Line is a book for aspiring entrepreneurs who sell their wares. The book goes step-by-step through how to set up a business and explores the various venues in which one might consider selling their crafts. I have gone back and forth on whether or not I should turn my hobby into a side career. There is a big commitment, especially for someone (like me) with no knowledge what it takes to OWN and run a successful retail business. After reading this book I feel more educated on what it would take to make my business a success and the level of commitment involved. This book covers not only what you need to do to get your business up and running (including pricing, record keeping, and even hiring), but a I have gone back and forth on whether or not I should turn my hobby into a side career. There is a big commitment, especially for someone (like me) with no knowledge what it takes to OWN and run a successful retail business. After reading this book I feel more educated on what it would take to make my business a success and the level of commitment involved. This book covers not only what you need to do to get your business up and running (including pricing, record keeping, and even hiring), but also what you need to do to build your business including selling venues, advertising, marketing and networking. There are excerpts from discussions with successful artists and crafters throughout the book. The information is comprehensive and extremely helpful. The book covers everything from selling online to selling at craft fairs or retail stores - It also reviews not only traditional marketing and advertising techniques, but also how to utilize and leverage different tools such as social media, blogs and more. This book would be a great resource for anyone new to opening a business but because it is so chock full of ideas. It would also be extremely useful though for an experienced seller who is in a rut or is simply looking for new ways to expand their crafting business. A must have resource for any type of artist or crafter looking to make money doing what they love! Kari Chapin walks the walk. She is currently not only promoting her own crafting business, but also her fledgling author-ship career, by doing the very things she outlines in her book. One issue with any book on the heavy use of Social media, of course, is that the landscape changes every second. This book was just published this year as an update to a previous version, yet... most of the information is already known and widely available. Kari herself points to this in her book. "Now, this best Kari Chapin walks the walk. She is currently not only promoting her own crafting business, but also her fledgling author-ship career, by doing the very things she outlines in her book. One issue with any book on the heavy use of Social media, of course, is that the landscape changes every second. This book was just published this year as an update to a previous version, yet... most of the information is already known and widely available. "Now, this best-selling guide has been completely revised and updated to include solid information on the latest on-line and social media opportunities for sales and marketing, as well as fresh advice and invaluable tips from successful crafters and artists." Sadly, the advice is not as fresh as when it was probably written. For the crafter who is just starting there is good, solid advice to follow. However, if someone is actually trying to make a living from their art, this book is probably things they already know. Perhaps it is marketed to the wrong audience. Kari has collected a great group of artisians, and their quotes truly elevated this book. Her own advice in presentation (pictures, captions) is only partially followed-- how about some photos of booth set-ups? Photos are spoken of frequently in the book, yet...not one single photo is included. Lots of cute illustrations, though. A nice read, from a marketing perspective... but not exactly ground-breaking. i especially appreciate all of the tips and recalled experiences from the various crafters and creators... it's reassuring to know that these very successful people were once in your (my) unsure shoes. it's very thought provoking too - re: online sales and craft fairs... i really didn't put much deep thought into anything outside of pricing and selling (which scares me to death). the book made me consider a reasonable return policy as well as the methods of payment i should accept. I didn’t find every part of this book useful. In fact, I skipped over some parts (something I almost never do). That said, when I have more time I might go through those parts that I didn’t find immediately useful. Because even if we’ve already learned most of the tricks of the trade discussed in a certain chapter, there’s bound to be a gem hidden in those paragraphs somewhere. I borrowed the book from a friend to read the section on craft fairs in order to prepare myself for our first craft fair I didn’t find every part of this book useful. In fact, I skipped over some parts (something I almost never do). That said, when I have more time I might go through those parts that I didn’t find immediately useful. Because even if we’ve already learned most of the tricks of the trade discussed in a certain chapter, there’s bound to be a gem hidden in those paragraphs somewhere. I borrowed the book from a friend to read the section on craft fairs in order to prepare myself for our first craft fair. I found the craft fair section super helpful, especially the checklist of what to bring. However, the part I found most useful was the section on finances. Jake and I have been working on trying different accounting systems for our Etsy shop but have been having a little difficulty perfecting a system that works specifically for our needs. Jake took many an accounting course for his business management degree, but those textbooks are assuming you’re a big business. Obviously, we’re not. So knowing the little things that are more specific to small businesses, like what qualifies as a write-off, is really helpful. There's no shortable of books like this on the market nowadays - everyone wants to capitalize on their hobbies & make a buck or two - I don't blame anyone for that, because I started doing that myself four years ago! Having a "hobby" business - aka a business that a lot of people do for "fun" or as a "hobby" has its own unique challenges not seen with other business models - like a restaurant, for example. If you own a restaurant, you don't have to worry about competing with the restaurant do There's no shortable of books like this on the market nowadays - everyone wants to capitalize on their hobbies & make a buck or two - I don't blame anyone for that, because I started doing that myself four years ago! Having a "hobby" business - aka a business that a lot of people do for "fun" or as a "hobby" has its own unique challenges not seen with other business models - like a restaurant, for example. If you own a restaurant, you don't have to worry about competing with the restaurant down the street who's doing it for "fun" and isn't really interested in making a profit, just to have fun. Crafters are different - we have to fight sterotypes and crafters who are selling their products for "fun", undermining those of us who do this for a living - like me. I borrowed the book from my local library because I keep toying with the idea of sell some of my handmade items. There are only so many items someone can reasonable keep or give as gifts. But they are fun to make. I just want more of feel for what it would take. I have been around business being started so the section on setting up a business didn't have any surprises for me. Just added a bit of detail. The rest of my life experience kept me from finding anything I hadn't brushed past already. I t I borrowed the book from my local library because I keep toying with the idea of sell some of my handmade items. There are only so many items someone can reasonable keep or give as gifts. But they are fun to make. I just want more of feel for what it would take. The rest of my life experience kept me from finding anything I hadn't brushed past already. I think the resource pages at the back of the book are the most valuable information for me. I can see where if a reader doesn't have a solid computer/internet background and hasn't been around business/marketing people this would be a good introduction into the practicalities of running a small business with some marketing advice.